This year I decided that I would try to incorporate some fall colours into my wardrobe. Maybe I was too early, but I couldn’t find a lot of fall colours that I enjoyed… then I stumbled upon this beautiful dark crimson top from Simons, and decided to make an outfit around it. This outfit was actually inspired by Rin from Fate/Stay Night. I always wanted a nice crimson top like hers and I adored the zettai ryouki (absolute zone) style she had going on with her black skirt and thigh highs. My outfit is a variation, but it incorporates all the elements. If I had black hair I would have also done some twin tails too! The top is a great fall staple. It’s warm, and makes you feel like a wizard cruising the cold winds! What kind of outfits are you inspired by? What is your favourite autumn outfit? Let me know in the comments section below! 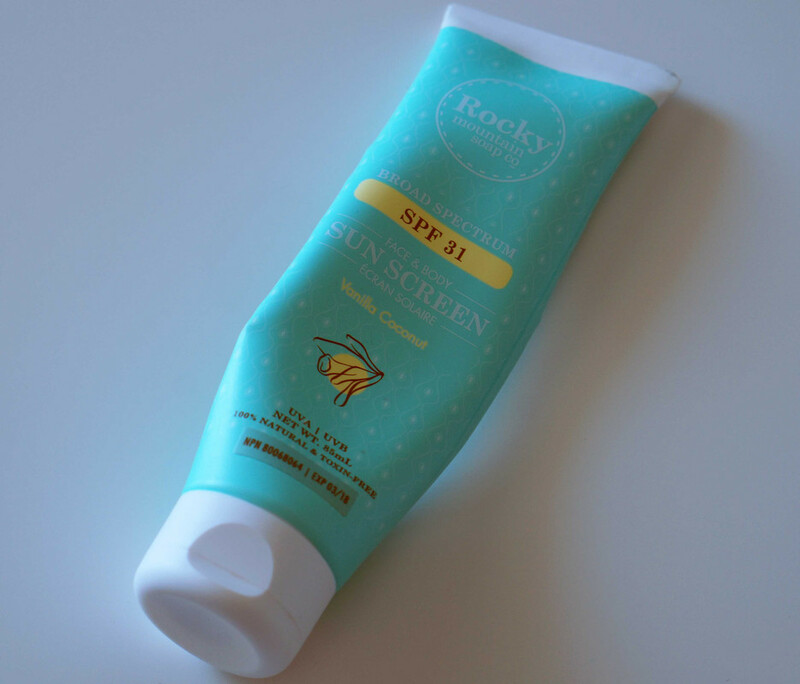 Natural sunscreen has been my preference for quite a few years now, and I love this one. It’s non-whitening and smells delicious! The smell reminds me of birthday cake icing… (too bad I can’t eat it…) It doesn’t feel greasy when applied and it doesn’t feel heavy at all on my skin. I had a desire to wear lip colours during the work week, and sometimes the loud, bright, and colourful lipsticks or liquid lipsticks that I had would be way too bold for the work day. I needed something that was muted, and still had colour to show my personality for the summer. They had just released the Ultra Blotted Lips line. It was exactly what I wanted. It took me a couple of days to find some swatches to figure out which shades I wanted. Then they had a free international shipping with no minimum order available and I ended up going ahead with Double Scoop, since that was unlike any shade of lipstick I had! This is one of my favourites in the Amuse Bouche Lipstick line. Kale is a rich, dark green lipstick that is almost black, and it’s the perfect way to complete your vampy or bold look! It’s VERY pigmented and vivacious, so I would recommend pairing this with a simple eyelook, but it can definitely go well with a heavier makeup look too! It all depends on your style. For me, the lipstick just screams out loud, so I would wear this if I’m too lazy to work on my eye makeup. I think it would go well with some false lashes too. The finish of this lipstick is creamy with a subtle shine. It’s long-lasting, and when you wash it off, it looks like you ate some kind of green goo, so you’ll need a strong lip makeup remover to wash it off or you’ll have to try a few washes to get this off, which in my opinion, is pretty impressive because that’s how you know it will last a long day! I definitely recommend this product. It’s fun & bold! Disclaimer: All opinions are of my own and I purchased this product with my own money. Hello readers! I just wanted to say thank you for your continued support for this blog. I started this project back in 2015 on the expectation that I would blog quite frequently. It happened for a while, but then I got caught up with other things and I feel like I have neglected it. I know that frustrating feeling of coming back to a blog that you enjoy reading, to only find out that there’s no new postings. I want people to enjoy coming here and have new content to read. I want to update it as much as I can with fresh reviews, updates and other kinds of posts. I want to create opportunities for this blog to grow, and also for myself to grow professionally. And so, as one of my 2017 new year resolutions, I will update this blog at least once per week! There may be times where I can’t keep that commitment because I am away or busy with work, but I am going to go through with this as much as I can. I know that my content doesn’t really focus on one area. I like posting about beauty, but I love to cook, eat, and travel as well, and I want to share all of that with you, among other topics. I thought about my blog name today, and to be honest it was just a cool nickname that I came up with, and now I’m wondering that because my blog is so multi-faceted, as well as what I blog about is kind of like an alter ego side of me, that perhaps I should rename this blog. I’m still thinking about it, as it’s got the same name as my other social channels (YouTube, Facebook, Instagram, Google +). But for now, I’ll focus on content. I’m also looking for opportunities to collaborate with local companies and I would love to help with PR for products that I believe in. If you want to chat about one, please send an email to: phixien1[at]gmail.com. Thank you again and look forward to more posts for 2017!! !